Hercules Fence of Newport News, Virginia specializes in Aluminum Fence Installation. All fences are the same, right? A fence is a fence is a fence. Well, not really. Each type of fence has its own unique advantages (and disadvantages). It is up to you to figure out which fence makes the most sense for your Newport News home. For some, wood is the only way to go. For others, it’s sturdy steel. Others go the more economical route, opting for chain link. But you are different. An aluminum fence is what you need! An aluminum fence makes a statement. These incredibly aesthetically appealing fences will help your home stand out amongst the crowd, making you the envy of your neighbors. Aluminum fences are actually very cost effective. These fences are much more affordable than you would think. Just contact Hercules Fence of Newport News to see if you can afford a new aluminum fence. These fences are extremely durable. Believe it or not, aluminum actually withstands the elements better than welded steel. An aluminum fence is also very low maintenance and will not need to be painted annually and very rarely need to be cleaned. Aluminum fencing with spear-topped pickets is incredibly difficult to breach and will help improve security. Hercules Fence is Virginia’s largest fence company, allowing us to offer you a premium quality aluminum fence without the premium price tag. Did we also mention that we are one of the top dealers in the country for aluminum fences? So why would you choose any other fence company? Take advantage of more than fifty-five years of fencing experience and contact Hercules Fence today. We look forward to hearing from you and meeting your fencing needs. 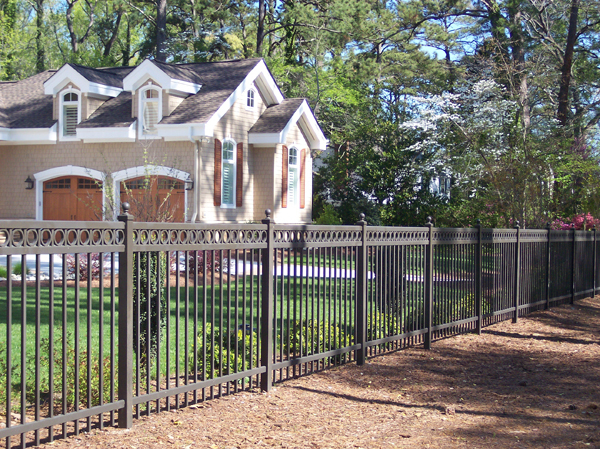 If you have any questions about Aluminum Fence Installation in Newport News, Virginia, you can contact Hercules Fence today by calling (757) 316-3600 or visit FencesNewportNews.com today! You can also follow Hercules Fence on Facebook, Twitter, Google+ and YouTube. This entry was posted on Friday, March 21st, 2014 at 1:44 pm. Both comments and pings are currently closed.